Note: This event was only available from 22 October 2007 until 5 November 2007. 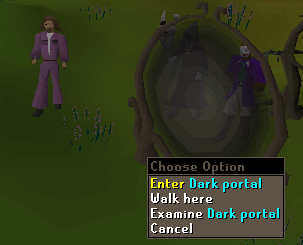 Enter the portal south of Falador, near the Elemental Wizards. This event is available to freeplayers and members, and has no requirements! It is a safe event as there's no chance of losing items. 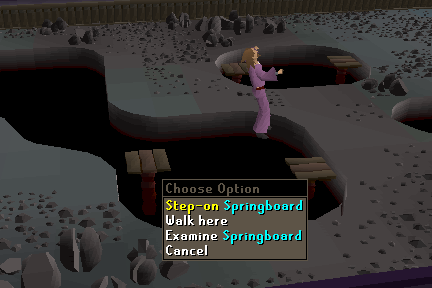 To start, head south of Falador near the elemental wizards. If you are of a lower level watch out for the Highwaymen, as they are prone to attack anyone who comes into their territory. Leave your furry friends at home, Death's more of a dog person. As you approach the portal nearly all light from the world is sucked away. Click on the portal to get started. It is represented as a present icon on your mini-map. If you log out during this event you will appear here, outside Grim's house. You will appear inside Grim's mansion. Head east and talk to the Grim Reaper. 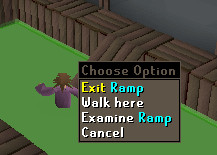 If you happen to log out, talk to Grim again to find out what stage you were up to. Note: You will have to regain any items that you had in your inventory if you log out. Grim asks you to prepare his house for his next servant. You will then be presented with two options. If you select 'That doesn't really appeal, I'm off.' the Grim will kill you and you will return outside his house. Note: As this is a safe event you will lose no items. 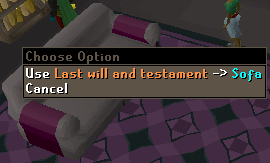 If you select this option you can still complete the event by talking to Grim again. Select 'I'll help out, no problem.' to continue with the event. Right-click on the doorway just north of Grim and select 'Pass Doorway.' 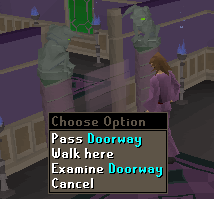 Randomly, or if you try to pass through a door that you haven't been instructed to, the Gargoyles might attack you sending you back to the start. 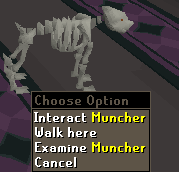 Just inside the doorway you will see Muncher, Grim's dog. There is an option to interact with Muncher, but beware, choosing the wrong option might land you back at the start. Continue north until you reach another doorway, and select pass. The Grim will present you with your next task. You are to make your way through the spider webs. The path is random - it's different for everyone. 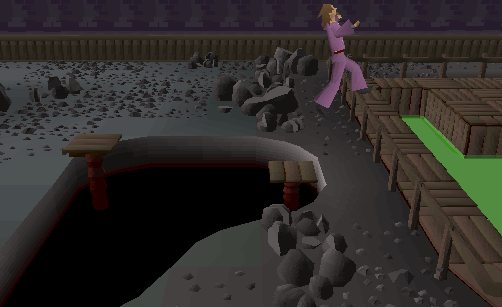 If you reach the skull and log out, you will need to make your way through the webs again. 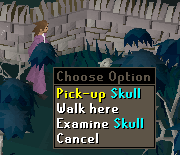 Right click on the skull and pick it up. Make your way back through the webs. As you are going through the doorway the Gargoyles will take the skull off of you. Go to the Grim's lounge, he'll tell you what to do once you get through the doorway. After reading the diary, which can be found on the table, it seems Muncher has wreaked havoc around the house. You're to search the room for Grim's items, in total there are 7 items to collect. Then put them back in their correct places by using the items on the correct locations. The diary will tell you where the items go. Go back into the main part of the house and climb the stairs. Grim wants you to test his obstacle course. You'll end up in some green goo. 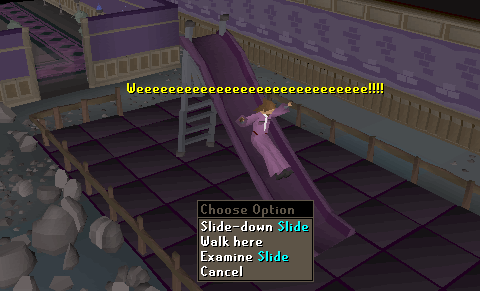 Wade through the goo until you see a ramp and exit through the ramp. In the next room you'll have to walk around the trapdoors. 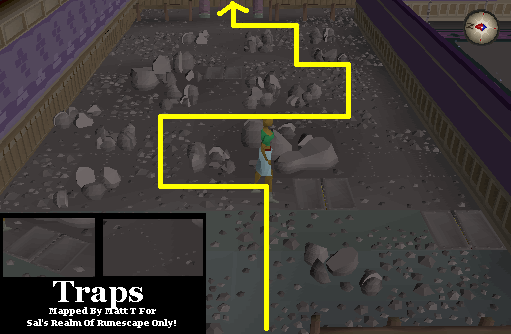 This step should be done in high-detail mode so that you can see the traps more clearly. If you step on a trap you will have to complete the obstacles again from the start. After passing through the last doorway you will learn you have the do the course again. Do the course again. 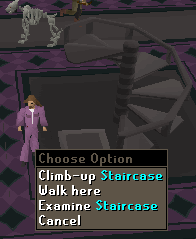 After you've completed it, go downstairs and speak with Grim. He kills you and you return outside the portal. It is now locked, as you have no need to go back down there. 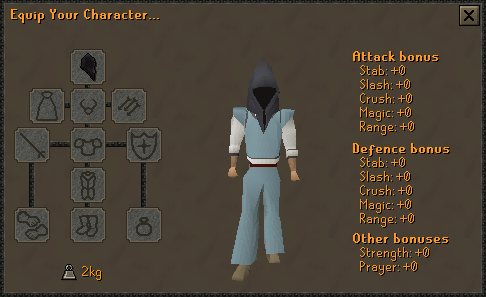 See the Item Database for detailed information on the Grim Reaper Hood. 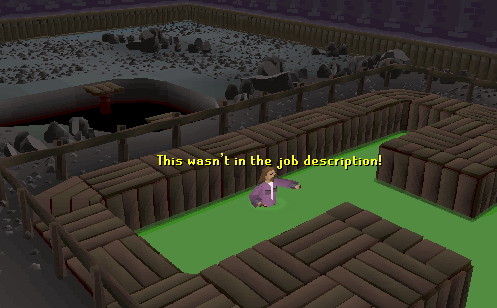 If you ever lose the Grim Reaper Hood you can get it back by speaking to Diango in Draynor Village. You will also unlock the 'Scared' Emote if you have not already done so.